The best friend of a woman who was killed in a car accident - shortly before her husband and children were mowed down in a hit-and-run incident - speaks out for the first time. Elmarie Lubbe (38), her husband, Theuns (39) and their two children Tristan (8) and Amory (4), and a friend’s daughter, Juliana Gomez (6) had been on their way home from a function when their Chery Q3 rolled between Riebeeckstad and Allanridge in the Free State. Elmarie was pinned under the car, killing her on impact. 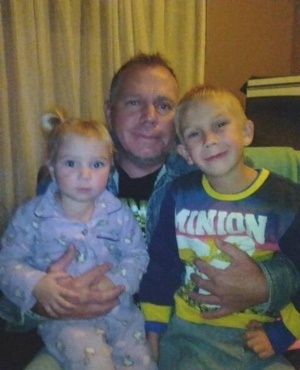 Theuns got the three children from the wreck and the four of them were standing in the veld next to the road when a bakkie struck them on Friday night. Stef Brand, Elmarie’s best friend, tells YOU that Elmarie had lived for her family. The two women’s homes are down the street from each other and they saw each other every day. “She was such a good mom. She made time to play with her kids and she and Amory, whom she called Poppie, were extremely close,” Brand says. Elmarie was a stay-at-home mom. “It’s such a huge loss . . . Everyone loved them,” Brand says. Neels Lubbe, Theuns’ cousin and the family spokesman, says Elmarie’s resourcefulness continually surprised him – she was able to do so much with so little. “There was never a shortage of love in their home,” he adds. Police are still looking for the driver of a white Ford Ranger bakkie. The driver left the bakkie with its North West number plates in the veld and ran away after the incident. Neels is still extremely emotional. “We don’t have a date for the funerals yet – we’re still waiting for the outcome of the autopsies,” he tells us. Theuns and Elmarie had been married for nearly 10 years. “Theuns had started out as a security guard [at a mine]. About two months ago he was promoted to shaft manager. They’d struggled financially until he got this job. Just the other day he told me he’s really enjoying his job and he’s so happy because he’s able to provide for his children properly,” Neels says. Neels says Theuns would never have drunk before driving his wife and kids home. Amory was bright, Neels says. “She was only four years old but could count to 20 and she’d always ask me, ‘Uncle Neelsie, when are you taking me to school?’ She loved animals and was a child who’d hug everyone,” he says. Reinette Taljaard is the bus driver at Brandwag Volkskool in Odendaalsrus, where Tristan had been in Grade 2. “Both of them were such well-mannered children. I always babysat him for an hour before his bus left. He was a real sweetheart. I’m going to miss his hugs,” Taljaard says. Sergeant Fikiswa Matoti from Welkom SAPS says a case of culpable homicide has been opened. Police are still looking for the owner of the bakkie.